Located on the edge of Portarlington, Spire Hill is close to the train station (10 min walk) the property was originally built in 1955 and has a gross internal floor area of approximately 205 sq.m. The property is approached via a recessed entrance with electric gates and is surrounded by 5.76 acres comprising mature gardens and an enclosed paddock. 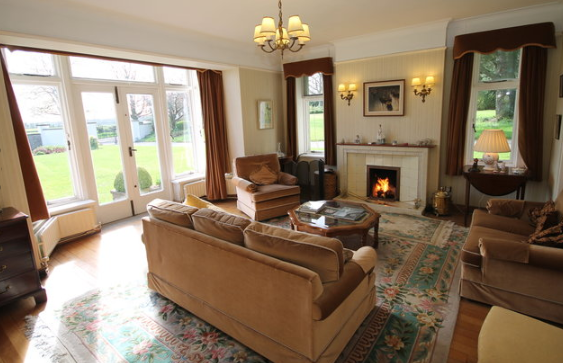 The residence sits on an elevated setting giving excellent views eastwards towards Killenard and the Wicklow Mountains. The house, although in need of some modernisation has been very well maintained throughout with several large reception rooms and a total of five bedrooms. Outside there are two car ports, garage and a range of stores in addition to a limestone Coach House (with 2 stables) which would be ideal for conversion into a studio, granny flat, workshop or office. Approached through a recessed entrance with electric gates the landscaped garden comprises lawns, flower beds and shrubs all enclosed by trees and hedges providing a haven of peace and tranquillity. There is a garage, various stores and 2 car ports. The property’s location makes accessibility to the city extremely easy with frequent daily train services (3 per hour at peak times) getting you into town in less than 40 minutes. In addition to this the 5 star Killenard Hotel is only a couple of minutes from the property offering golf & leisure centre facilities. The historic Emo Court and grounds are also close by and this is a fabulous amenity. In addition the property is also directly across the road from a mature deciduous wood, open to the public.